The teenager who allegedly used a shotgun and a revolver to kill 10 people and wound 10 others at a Texas high school Friday admitted he didn't shoot people he liked and meant to kill the ones he did target, a probable cause affidavit says. Suspect Dimitrios Pagourtzis , 17, has cooperated with police, said Galveston County Magistrate Mark Henry said. Henry denied bail for the student, who is accused of capital murder of multiple people and aggravated assault on a public servant. Pagourtzis said little during a video court appearance, answering "Yes, sir" when asked whether he wanted a court-appointed attorney. He was not asked to enter a plea. The alleged shooter used a shotgun and a .38 revolver that were legally owned by his father, Gov. Greg Abbott told reporters. Two school resource officers were on the campus and confronted the shooter "early on in the process," Abbott said. • A student who survived being shot in the head tweeted: "I'm so greatful and blessed that god spared me today." Rome Shubert showed CNN affiliate KTRK where a bullet went in the back of his head and came out near his left ear. • A Pakistani exchange student, Sabika Sheikh, was killed, the county's embassy in Washington said. • One classmate told CNN the alleged shooter was "really quiet and he wore like a trench coat almost every day." • The governor offered his sympathies to the victims then called for lawmakers and others to come together to prevent more tragedies. "We need to do more than just pray for the victims and their families. It's time in Texas that we take action to step up and make sure this tragedy is never repeated ever again." 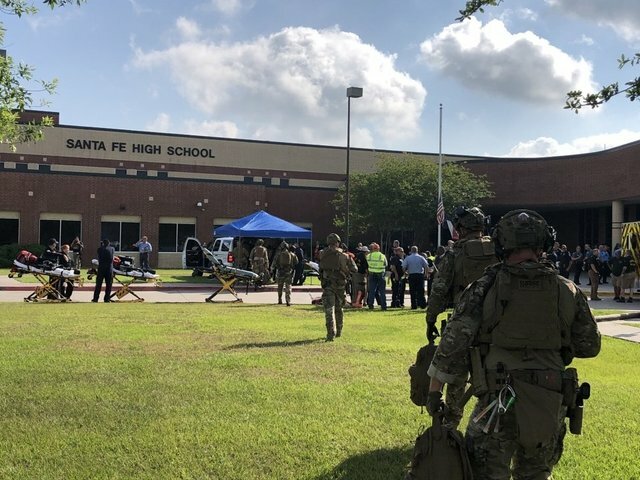 • Retired Houston Police officer John Barnes was one of the people shot at Santa Fe High School, a hospital official said. Houston's police chief tweeted that he visited the hospital where Barnes was being treated and that Barnes was "hanging in there." The officer was working as a Santa Fe officer, a police union official tweeted. An armed person walked into an art class at the school and began firing what looked like a shotgun, a witness told KTRK. Victims were being treated at three hospitals, authorities said. 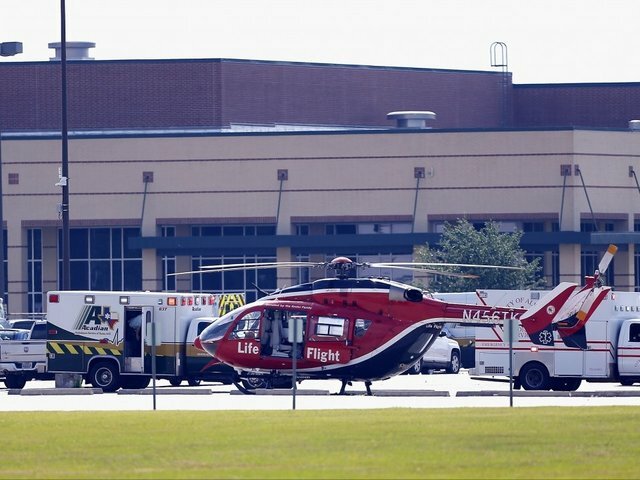 Eight people went to Clear Lake Regional Medical in Webster, Texas; two patients were treated at Mainland Medical Center in Texas City; and four patients went to John Sealy University of Texas Medical Branch in Galveston. It is unclear whether they were all wounded. A witness who spoke to KTRK also said she heard an alarm. She didn't specify if that was before or after the gunfire she described in the art class. Trump addressed the school shooting, saying that mass shootings have been "going on too long."